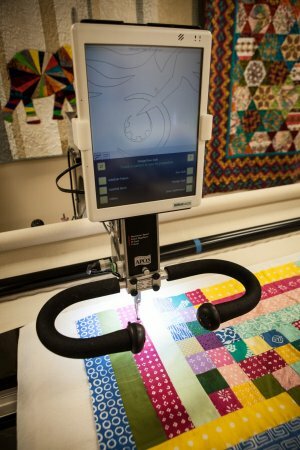 We provide professional computerized machine quilting using an APQS Millennium longarm quilting machine along with an Intelliquilter computerized quilting system. These machines together make it possible to have a consistent pattern from start to finish. We can do simple, computer-generated, edge to edge quilting or custom, block-by-block quilting. If we don’t have a pattern that you like available we can order one you do like. No pinning or basting is necessary. Please do not embellish the top with buttons or crystals before quilting. Clip and remove all loose threads from the back of the pieced top. They can get trapped between the top and batting and show through to the front of the finished quilt. Batting is available at the studio for $8.50 a yard. It is Hobbs 80/20 in White at 108” wide, Natural at 120” wide and Black at 108." You can provide your own batting but we prefer it to be a cotton blend. Thread is available at the studio for a fee. It is important that the thread be one that will work with the machine so we prefer to use this thread. If we do not have the color you want we can order it. We are able to make a custom label with a photograph. It is important to us that each quilt is documented on the back with the information of the maker, who it was made for or why it was made and also to name of the quilt or the pattern used in its construction.